The Blue Sky Cellar is one place we like to quickly check out every time we visit Disney's California Adventure. It is just a small building, but it is totally worth visiting as it has exhibits and a short movie about upcoming new attractions at the park. 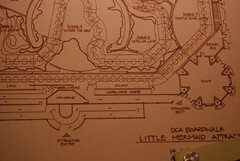 This time the main exhibit area was about the new Little Mermaid ride opening on June 3, 2011, and the movie also showed the Test Track like ride that will be in the new Cars Land opening in 2012. 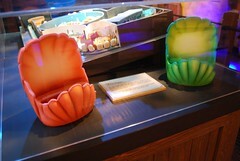 I liked seeing the model of the ride track for The Little Mermaid ride. The clam shaped vehicles are almost exactly like the Doom Buggies in The Haunted Mansion over in Disneyland. While the track model most definitely does not show a wheelchair accessible vehicle, we are pretty sure there will be one because it is a tame ride and no reason there cannot be. Plus, the architectural drawing of the ride shows a wheelchair queue. Of course, if they figure out how to do this ride with a wheelchair vehicle than I for one really hope they add an accessible Doom Buggy to the ride track the next time they shut it down for the holiday changeover. We can at least dream on that! We are still unsure about the whole Cars Land. So far the only ride we have seen anything about is the Test Track like thing and obviously that cannot be a wheelchair accessible ride. That is still a ways off and not too much details, yet, though. Besides the information on the upcoming attractions, there are also some touch screen monitors that you can play Disney trivia on and see how well you know your Disney stuff. Mik has no problem playing these from his wheelchair, as some if not all are down more at kid height than adult height. The inside of building is wheelchair accessible, but the exit is a manual door. We went out with me rolling Mik backwards through it, but then there is little room to turn back around once you get out. It would be easier to just go back out the entrance if you do not have someone to open and hold the door open for you, which was not an option for us since there was no one else inside the Blue Sky Cellar at the time.